Garbage patches are areas of increased concentration of marine debris that are formed from rotating ocean currents called gyres. 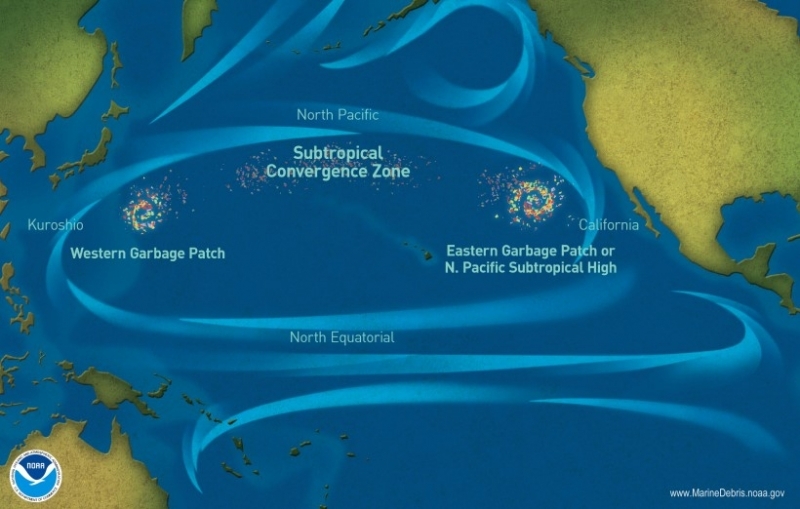 The most publicized garbage patch is the Great Pacific Garbage Patch, located in the North Pacific Subtropical Gyre in the northern Pacific Ocean. However, there are actually several garbage patches located in gyres around the world! How big are they? Because gyres are dynamic, the size of these concentrated areas is constantly changing, making it extremely difficult to estimate the size of garbage patches. In addition, although these areas have greater amounts of marine debris, they are not forming “islands of trash.” Instead, this debris is continually mixing and is spread throughout the water column, from the surface all the way to the ocean floor. What kind of debris do we find? Debris in the garbage patches is primarily made up of plastic pieces less than five millimeters in size, called microplastics. Many of these microplastics are the result of larger plastic debris breaking into smaller pieces due to exposure to environmental elements such as sunlight, wind, and waves. Other microplastics are manufactured at this size, such as microbeads found in some personal care products or microfibers from synthetic clothing. With such small debris making up the majority of the garbage patches and the constant movement of this debris, it’s possible to sail through a garbage patch without even realizing it! 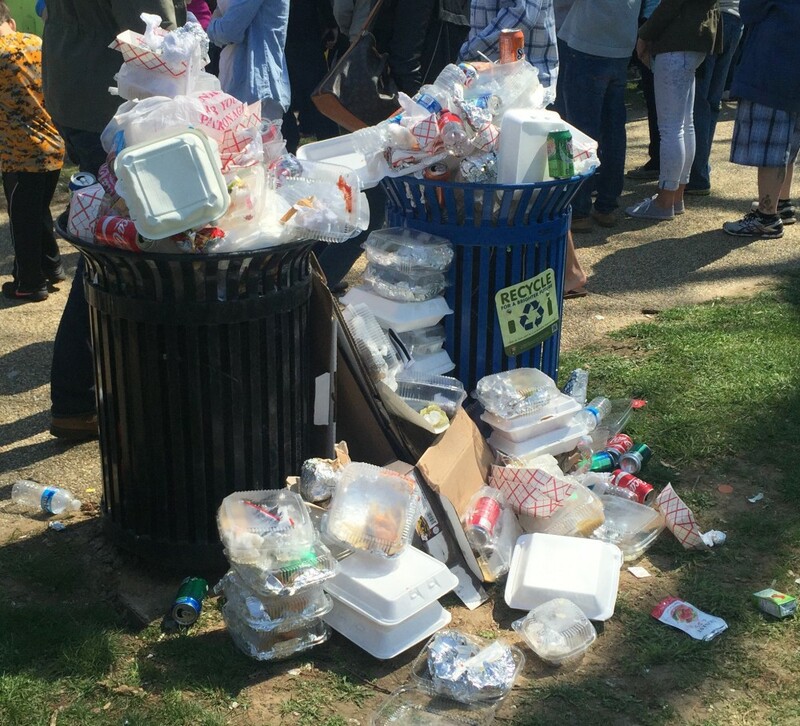 Can we clean them up? Since the debris in these areas is so small in size, is constantly being mixed, and is located throughout the water column, removing it proves to be very difficult. For this reason, we generally focus removal efforts on shorelines and coastal areas, before debris has the chance to make it to the open ocean. What can we do? Though removal is one important piece of the puzzle, prevention is ultimately the key! If we consider an overflowing sink, it’s obvious that the first step before cleaning up the water on the floor is to turn off the faucet — that is what we mean by prevention. 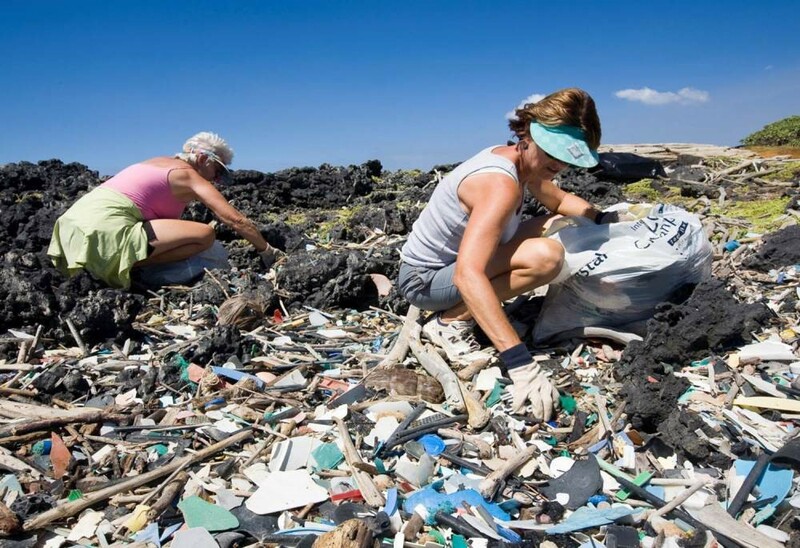 By working to prevent marine debris through education, outreach, and making an individual effort to reduce our own contribution, we can put a stop to this global concern. Ultimately the EPA IS RESPONSIBLE! ACCOUNTABILITY, RESPONSIBILITY, NO ONE IS TAKING EITHER! Pointing Fingers, I only have a Job, get paid hourly. I'm curious about your statement of marine debris becoming spread throughout the water column. I feel it is misleading.Can you explain how a piece of plastic, for instance, that has a specific gravity of .90 would ever sink? Floating objects that can become waterlogged(wood, paper and cloth) can sink. Floating items that contain air or other substances lighter than sea water that leak out can sink. Floating items that become heavily colonized can sink. Floating items very near seawater's specific gravity that are effected by waves, currents, passing boats, etc. can temporarily sink. Feathers, which are heavier than air, will fly through the air with a breeze, but they fairly quickly sink to the ground, at least temporarily until another breeze. Otherwise, the skies would be full of every feather that has come off the birds. That is very similar to marine debris's situation in water. Having a collection of over 50K benthic marine debris items, many that I have subjected to photographed buoyancy tests, in order to illustrate their non-buoyancy when I incorporate them into my art, I can assure you, an object hovering in the water column is extremely rare. Even the few that do, are due to the temporary drying out or loss of the water that entered their cavities that is temporarily replaced by air. They soon sink, just as water-logged wood that dries out then is waterlogged again when put back in the water does. I'd be glad to share my research, pictures, etc. about buoyancy so you can clarify the situation, as you did about the harmful silliness of "Trash Islands" in the Gyre. Thanks John! As you pointed out, debris items can have different densities and buoyancies, and with moving currents, winds, and waves, these debris items are constantly being moved and mixed, thus being found throughout the water column. I give up. If a tornado picks up a softball-sized rock no scientist would ever say "rocks are found throughout the air column." While you could argue that it is technically correct and even show me a picture of one, to characterize the circumstance as such is misleading at best. If you said feathers are found throughout the sky, it might be technically true. It is not what I would expect a scientist to say without numerous qualifiers to prevent the wrong idea of reality. Somebody looking out there window would probably never see one. What would their view of your description of reality be after that? The "Trash Island" meme, something I hear intelligent laypeople relating frequently, is a good example of the harm that can be done to our efforts to reduce marine plastic pollution. The facts are disturbing enough without misleading claims. I have worked as a citizen scientist on the plastics problem. I have looked through a microscope hundreds of times to count the plastic particles that are suspended in seawater. I have never seen a clean sample. Although some plastics may have a specific gravity of .9, PVC and polyester are in the range of 1.4; Teflon is 2.2. Lots of plastics denser than water. As important as these facts are, it is the size of the particles and the ‘stirring’ that goes on in the currents that causes the issue of the dispersal throughout the ocean and particularly the water columns. It is not a static pool. Many of the particles are micro-fibers from your laundry that are too small for city water treatment systems to capture in their filters before the water is discharged. Tons of these daily into rivers ins coastal waters. About the size of zooplankton, they are easily suspended and mixed throughout the water column. You may have in mind little chunks of milk jugs, but the vast majority of the plastics swirling up and down the water columns are minute, look like plankton and easily caught in the ‘tornado’. In addition, the fact that they are plastic makes them an excellent attractant for organic chemical pollutants, all the more toxic to marine life mistaking them for food. Again, you might think all oil floats, but just look anywhere there has been an oil spill or bilges pumped, and you can sink your feet into oil crud on the bottom of the bay. Let alone be microscopically bound to plastics. Nice to hear from another citizen scientists. I'm ill this week,so will keep this short. First off, your view of the ocean water movement is faulty. The turnover of deep water to the surface is extremely slow. While there are upwellings and downwellings, mixing is minimal on any time relevant to mankind's plastic production or any volume scale one uses. Grabbing a sample from near the surface where waves and winds can accomplish mixing and temporary sinking of buoyant particles represents a minuscule amount of the water column. There simple is not "swirling currents" mixing the ocean as you characterize it. The ocean averages 12,000 feet deep. A sample from the top few feet in no way justifies the "dispersed throughout the water column" claim. Look up thermocline circulation. Here is a quote from a paper that much more accurately describes the situation: "As a passive particle, this plastic debris is subject to the physics of mixing within the ocean surface boundary layer. We hypothesize that the buoyant upward flux of plastic pieces is balanced by a turbulent downward flux for moderate wind conditions, resulting in vertically‐distributed plastic debris throughout the surface wind‐mixed layer. )note it is a hypothesis and refers only to the "surface wind-mixed layer" That's a tiny portion of the water column, as I have repeatedly said. As to oil and my understanding of its behavior in the ocean, you might find this Flickr folder of interest: https://www.flickr.com/photos/johnvonderlin/albums/72157626795811759 I have written extensively about tarballs and used them in a few of my artpieces. More on that when I feel better. Thanks for your comment. Very informative, thank you John! https://upgyres.org/about-us/ has a video that explains the variation of the micro and macro plastics and all the types of plastics in between that pollute our planet with different weights, densities and sizes. NOAA's video https://oceanservice.noaa.gov/facts/microplastics.mp4 also shows plastics of different densities and how they behave for clarity. Helping the garbage patches are just a start. The Earth's water is a limited resource, and we are wasting it. It takes gallons of water for people to flush the toilet, shower, brush their teeth, and use their sprinklers. There is so much more that we can do to save water. People don't understand that by wasting such a valuable resource now, in the far, far future, there won't be enough clean water to survive. It is already staring to happen around the world. The government needs to open their eyes, and put more restrictions in place to help sustain water. Environmental catastrophic predictions are extremely unhelpful. When they are falsified it reduces the efficacy of well-balanced, accurate warnings for a good chunk of the populace. The "Cry Wolf" story is an easily graspable example of that concept. Look at the website Gapminder.org and see that the statistics are undeniable. The world is getting better in almost every way. I assume you are young because if you were old you'd know how much worse pollution of nearly type was in the past. When I was young, blacks had to ride in the back of the bus, woman could be mothers, nurses,teachers and not much more, gays had to stay hidden, smog was so thick you could cut it, mercury and a thousand other toxins were dumped wherever convenient, caring about Endangered species was whether you could shoot one before they were gone, trash was burned openly at large dumps, lead was spewing out of every car's muffler,... Plastic in the oceans is a growing problem. It is my life work. But, the dangers it poses to our world are more esthetic than world ending. Do your part. Fill your life with happiness and wonder. We'll solve this. Hi John. Superb! You have enlightened me with fact I didn't know (rather than believes as is common nowadays)! I didn't whatsoever get one thing you were saying. May I ask you what prevents plastics with densities above 1 to go down the water column (as stated by the other participant)? Sorry if you have answered it already, I just didn't get your explanation. Many thanks! Actually seawater has a specific gravity higher than 1.0 which is distilled water at 4 degrees C. with no dissolved solids. The specific gravity of seawater varies between 1.02 to 1.03. That said it is the buoyant force that determines the movement of something when it is placed in a gas or liquid. If an object's specific gravity is greater than the liquid or gas it will sink. Lighter it will rise. Waves, currents, or some other force can force a lighter object downsome small distance usually but the buoyant force will soon return it to the surface. There are charts showing the specific gravity of various plastics. Those slightly higher than 1.03 will sink, those below will float. Those below that float can be modified by colonization (algae, Gooseneck barnacles, attached objects that are non-buoyant or ones that become so because of water-logging) and sink. Those that sink (corpses for instance) can float back up if decay generates gases that are trapped. Light floaters can be temporarily pushed down in the water column by downwelling currents, breaking waves, passing boats, you jumping on top of them, but will soon return to the surface. I once rescued a $1200 Rescue dummy that the owners when returned I returned it told me that when pushed deep enough it compresses and apparently squeezing the air in the foam's structure keeps it on the bottom. Just research "buoyant force" and ask yourself why should one of the Laws of Nature" be thrown out to increase alarmism about the very real problem of plastic pollution in the oceans. Crying "Wolf!" never helps bring about the needed solutions and in fact leads others to doubt your veracity and accuracy even when you are right. I'm just tapping this out between other matters, but think I got it right. I'm always eager to have my errors pointed out though. Enjoy.